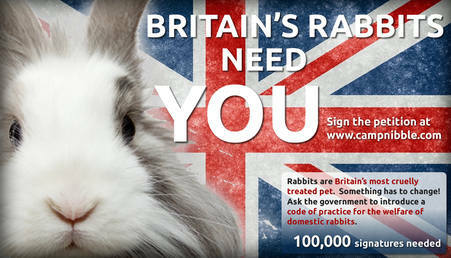 Rabbit Welfare in the UK..... Something has to change! Despite our charity opening its doors to many types of small animal consistently around 80% of our rescue animals are rabbits. Sadly, all species of pet animal fall victim to neglect and abuse to some extent. However, through the course of our work it has become shockingly apparent to us that the UK is in the midst of a serious rabbit welfare crisis. We are not alone in reaching this conclusion. Recent studies have identified rabbits to be the most neglected and cruelly treated of all pets. As the UK’s third most popular pet this amounts to a significant number of animals unnecessarily suffering. Most of our rescue rabbits have ended up at Camp Nibble due to people taking on rabbits with little realisation of what is needed for them to live happy, healthy lives. They are widely misunderstood animals and are very often mistakenly taken on as cheap, easy pets. In many cases the responsibility for their care is left in the hands of children. Like many modern rabbit welfare organisations we do not recommend rabbits as ideal pets specifically for children. Rabbits are intelligent sensitive animals that deserve to be viewed as family members (in the same way as cats and dogs usually are). We believe that the common perception of rabbits as cheap, easy pets for children is a myth, or at least it is if the welfare needs of the rabbits are being met properly. Historically, thousands of rabbits have made very cheap easy pets for children living as neglected living toys. However, it is becoming recognised and will hopefully soon be accepted that this method of keeping rabbits in solitary confinement shut up for long periods in hutches is completely out dated and exceptionally cruel. Many rabbits are taken on by very genuine families who simply have unrealistic expectations of rabbits as pets. A typical rabbit does not enjoy being cuddled/picked up. Therefore, it is not surprising that many children tire of them very quickly. Although, we do come across the odd lovely ‘cuddly’ bunny these are exceptions not the norm. We strongly urge parents not to buy rabbits as pets solely to be cared for by their children. However, with genuine adult interest in their welfare and realistic expectations rabbits can in some cases make wonderful family pets. Welfare organisations now understand well what rabbits need for their welfare to be best met. However, this knowledge has far from been adopted by the general public at large. There is still a huge gap between the general public’s traditional view of rabbit keeping and the modern day view held by welfare organisations and the Rabbit Welfare community. New figures from the Rabbit Welfare Association and Fund (RWAF) the UK’s leading authority on rabbit welfare reveals that at least 67,000 abandoned rabbits pass through UK rescue shelters each year. This important piece of legislation was a significant step towards improved animal welfare in the UK. However, the welfare needs above must be applied in very different ways to correctly meet the needs of different types of animal. Many pet rabbits are still housed alone in tiny hutches with access to very little, or often no additional exercise. The most common ailments seen in pet rabbits such as dental disease and obesity are attributable to an inappropriate diet and a lack of freedom of movement/exercise. Rabbits are still viewed by many as cheaply acquired even disposable pets. As a result of this many owners still do not seek veterinary care when needed for their pet rabbits. In many cases they are bought on impulse. Thousands of rabbit owners are far from keeping their pet rabbits ‘protected from pain, suffering, injury and disease’ and in failing to do so doing are in fact in breach of the law. The reality is that far from being cheap, easy pets when cared for properly rabbits have complex needs. ‘Rabbit savvy’ owners now understand that their rabbits need space and lots of it. They understand that a rabbit’s diet should consist of mainly grass/hay. They realise the importance of neutering, vaccinating and making contingency plans for potentially expensive vet visits. They respect that as naturally social animals rabbits do best with another neutered rabbit/s for company. The issues surrounding the current rabbit welfare crisis in the UK are complicated and there is sadly no quick fix. However, we believe that the first important step forwards is for the government to introduce a code of practice for the welfare of domestic rabbits. Codes of practice currently exist for the welfare of dogs and cats. These documents compiled by experts outline in detail what is needed for these animals to be correctly cared for, and what owners need to provide in order to comply with the Animal Welfare Act 2006. These codes of practice also help the courts decide when an animal welfare offence has been committed. Wales introduced a code of practice for rabbits in 2009, the rest of the UK needs to follow their lead. If cared for properly rabbits do not make not 'cheap' 'easy' pets. For the most accurate and up to date advice on all matters rabbit related please visit the Rabbit Welfare Association advice centre.